COMPLEX SAYS: Carmelo Anthony and LaLa Vasquez got into a Twitter fight with Kat Stacks after the industry groupie said one of her friends was with Carmelo in his hotel room. LaLa responded with a threat, but her hubby took it a step further by offering $5,000 to anyone who slapped Kat Stacks and taped the incident. 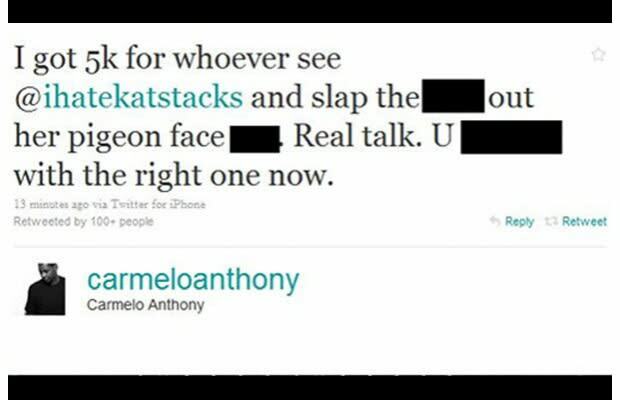 Melo later claimed that his account had been hacked (right) and Kat Stacks threatened to file charges. Since then, Brandon Jennings has also got into beef with Kat Stacks over Twitter. Is it any coincidence that Kat was locked up only months after this tweet?